The Polish progressive quartet’s sixth album sees a slight shift in attitude and direction as they delve deep to challenge their modus operandi. Seems there’s something about prog rock and time travel at the minute. On their new album, you’ll find fellow Inside Out label mates Spock’s Beard singing about Bennett Lamb building a time machine and travelling back to the dawn of civilization…or 1983 as we know it. 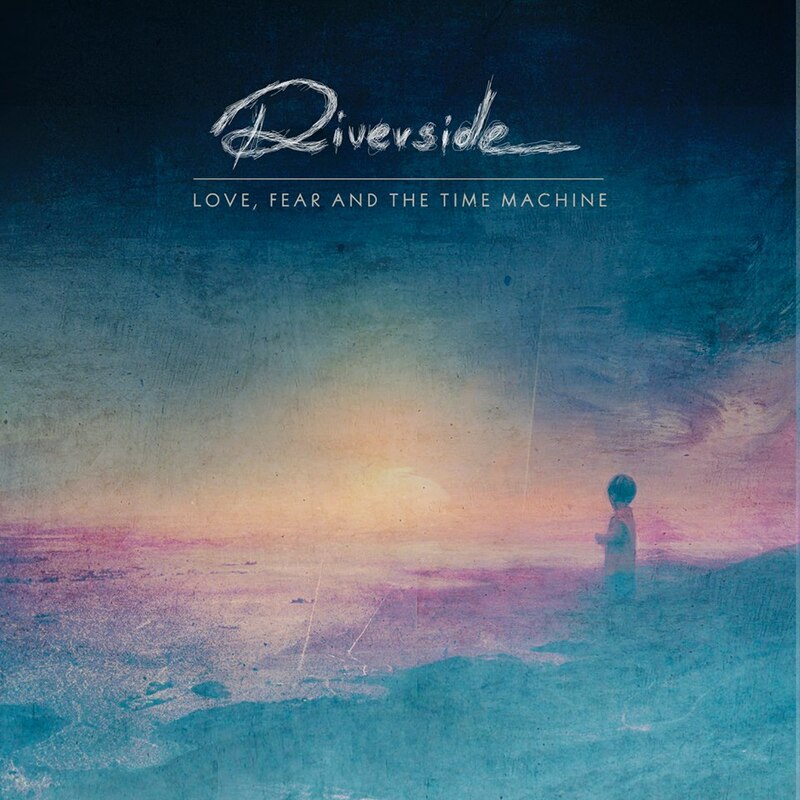 Now we find Riverside adding the time machine/travel notion into their new album. Lyrically, there’s a loose thread running through the songs, carrying a message about the impact of making life changing decisions; transformations which on the one hand are exciting and liberating yet on the other, carry the fear of the journey into the unknown. A far cry from Dr Who and Back To The Future, more philosophical and thought provoking and if you’re going to have some sort of theme, why not go for it big style. ‘Love, Fear And The Time Machine’ also continues the playful little idea with this, the sixth album, having six words in the title (the first three had three word titles, while the fourth and fifth followed suit with, you’ve guessed it, four and five word titles). Having cleared up all the necessary details, how’s the music? By contrast to earlier Riverside it’s arguably verging on mellow and many will feel all the better for it. Also by reining in the length and essentially softening the vocals to a level it makes you wonder why you’d want to hear anything which involves dark screaming . There’s also what sounds like quite a contemporary mix and production – not as metallic as the nu-prog of Leprous and not as old school as Spocks, but more, well relaxed and comfortable in its own skin. Everything seems expansive, open and light – the brightness and space and the calm vibe – maybe in their dabblings into a fresh approach they’ve stumbled upon their niche. For those who consider album sequencing an art form, this one’s a perfect example of the one that starts with an absolute belter, a real bobby dazzling peach of a track. ‘Lost (Why Should I Be Frightened By A Hat? )’ – a brilliant enough title if ever there were one – has all the hallmarks of a classic album/gig opening song. Building deliberately and atmospherically before the drums kick in combo with a killer guitar phrase and for an added thrill to see how it translates into live performance, check out the uplifting set opening version at the end of the review. Michal Lapaj’s organ, simple yet effective and not for the last time on the album – see ‘Caterpillar And The Barbed Wire’ and the lower key ‘Afloat’ where it’s most effective in setting up the anticipation and mood. Even where the music takes a journey along a slightly more heavy path like it does at times during ‘Under The Pillow’ and ‘Discard Your Fear’ it appears much more subtly rather than a jarring invasion. Mariusz Duda’s vocals on the album are a revelation. He’s talked about “an optimism and willingness to change for the better” in their attempt to leave behind the expected template set in the seventies and eighties and both musically and vocally Riverside have carried that optimism off to a tee. Some fans may bemoan the fact that nothing on the album which hits double figures in terms of track length yet they show that seven and eight minutes are long enough to make the point. Not so much a case of less is more or clockwatching, but when they go longer on ‘Saturate Me’ and ‘Toward The Blue Horizon’, the latter reminiscent of the direction taken by the more prog orientated Opeth, they show that they can effectively combine the light and the shade without it being too contrasting or grating – more a gentle blurring of the two extremes. It’s also the pick of the two longer pieces although both impress with some nice instrumental sections. Bringing things to a end is ‘Found (The Unexpected Flaw Of Searching)’ closing off an hours journey through the lost and found circle, delivering ‘Love, Fear And The Time Machine’ as the album that the fans have asked for. But be careful what you wish for. There’s no display of pretentious instrumental virtuosity but a real band energy all combining to show that listening to the fans while at the same time sticking to your own vision is a lethal combo. An unmitigated success and an album which must see Riverside becoming one of Inside Out’s flagship bands. You can find Riverside online here. They have a youtube channel here and are also on Facebook and tweet as @riversidepl. Album of the year so far for me. Ace!